Online safety is introduced to students through the ICT curriculum and in addition, it is addressed each year during PSHE/Citizenship lessons. We also run online safety assemblies and special events such as Safer Internet Day which takes place in February. Our online safety policy is an integral part of our safeguarding policy and can be found on the policies page of our website. This policy is reviewed annually. In addition all students sign our Acceptable Use Policy which can be viewed here. Online safety is an integral part of our behaviour policy and online safety issues are monitored and addressed regularly to address the constant changes in the use of technology. Below is a selection of videos (as requested by the Parental Forum) providing guidance for parents on how to tackle the issues raised by online safety. This video produced by Child Exploitation and Online Protection Centre (CEOP) provides useful information for parents / carers. Create a family agreement to establish your children’s boundaries, and your expectations, when on the internet. Give your child strategies to deal with any online content that they are not comfortable with – such as turning off the screen, telling an adult they trust and using online reporting facilities. Google+ Safety Centre: Provides useful information and tips for parents and carers, teenagers and educators. These pages do not require a Google account in order to view them. Twitter Help Centre – Tips for Parents: Provides useful information and tips for parents and carers. These pages do not require a Twitter account in order to view them. The Child Exploitation and Online Protection agency CEOP: Advice for parents, you can also report any concerns directly to the police through this website. 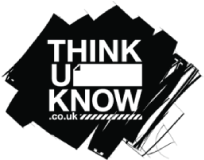 Click the logo below to visit the “Think U Know website”. In school the point of contact will be the Head of Year. Serious concerns relating to child protection should be reported to the school’s child protection officers. Students can protect themselves online by reporting incidents to the Child Exploitation and Online Protection Centre by clicking on the CEOP button. Internet Watch Foundation: The UK’s hotline for reporting illegal content found on the internet. It deals specifically with child abuse and criminally obscene images hosted in the UK and internationally. ParentPort: A website run by the UK’s media regulators, allowing you to report content unsuitable for children found in a programme, advert, film, video game, newspaper/magazine or other forms of media.